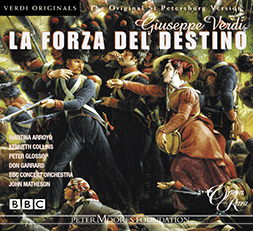 Opera Rara’s acclaimed series of the historical BBC broadcasts of Verdi operas as they were originally heard continues with La Forza del Destino. 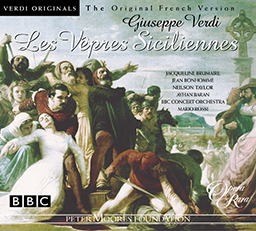 Opera Rara’s acclaimed series of the historical BBC broadcasts of Verdi operas as they were originally heard continues with La Forza del Destino. Here for the first time on CD you can listen to the original 1862 St Petersburgh version. And how does it differ from the 1869 version we hear today? The original opera is darker with a grittier integration of text and music and is truer to the original source: Angel Perez de Saavedra’s play Don Alvaro o La Fuerza del sino. Instead of the elaborate overture that Verdi added for the Milan premiere, a brief prelude catapults us into the opening scene. Act 3 ends with the final confrontation between Carlo and Alvaro, instead of the rousing “Rataplan” chorus of the revision, the act concludes with Alvaro’s solo, thereby focussing dramatic tension with far greater intensity on the central issue of the opera; the role of fate in our lives. At the end of the opera, where the later version offers a resolution based on spiritual consolation, Verdi confronts headlong the logical implications of his plot and its brutal consequences. The magnificent cast assembled here includes superb Verdians, Martino Arroyo and Peter Glossop. They interpret Verdi’s original score with a commitment and enthusiasm that will certainly not disappoint. Booklet includes complete libretto with translations in English, French and German. Roderick Kennedy, Martina Arroyo, Alison Truefitt, Kenneth Collins, Philip O’Reilly, Peter Glossop, Kenneth Bowen, Janet Coster, Derek Hammond-Stroud, Don Garrard, David Fieldsend. BBC Singers, BBC Concert Orchestra, John Matheson - conductor. The Marquis says goodnight to his daughter Leonora. He notices how anxious she seems, and assumes it is because he has taken her away from Alvaro, a nobleman of South American extraction whom she loves but whom he regards as unsuitable for her. The Marquis leaves, and Leonora’s maid, Curra, continues with preparations for Leonora’s elopement with Alvaro later that night. Leonora wavers, distressed at deceiving her father and leaving her native Spain; she bids her homeland a sad farewell. Horses are heard and Alvaro appears on the balcony. Leonora tells him she is reluctant to set off without seeing her father once more. Alvaro persuades her to go straight away and they head towards the balcony. There is the sound of footsteps and the Marquis storms in. He orders his servants to arrest Alvaro, who swears that Leonora is innocent. He throws his pistol to the ground. It goes off, mortally wounding the Marquis, who, dying, puts a curse on his daughter. She and Alvaro leave. Alvaro and Leonora have become separated by circumstances. In the local inn, villagers and muleteers sing and dance and dinner is announced. A ‘student’ says grace. (He is in fact the Marquis’s son Don Carlo, in disguise, and is in search of his sister Leonora and her lover.) Leonora appears, dressed as a man, having recently arrived with Trabuco, a muleteer. She recognizes her brother and quickly goes away again. Carlo starts to question Trabuco about the identity of his travelling companion, but they are interrupted by the arrival of Preziosilla, a gypsy woman. She urges the men to go to Italy and fight the invading Germans, and sings a rousing, patriotic song. Carlo interrupts her to ask her to tell his fortune. She predicts tragedy, and quietly tells him she knows he is not a student. A band of pilgrims passes by and everyone joins them in prayer. Leonora reappears, prays that she may be saved from her brother’s vengeance, and withdraws. Carlo again asks Trabuco about his companion, who has not joined them for dinner. Trabuco evades answering and goes off to bed. Carlo is prevented from looking for the strange visitor and is asked to explain who he is. He says his name is Pereda and that he has been helping his friend Vargas find Vargas’s sister and her lover, who killed Vargas’s father; the lover, however, has escaped and sailed to America. The assembled company resume their singing and dancing before everyone retires for the night. In the bright moonlight, Leonora, exhausted, recalls her horror at hearing her brother’s dreadful story; she is particularly distraught at the implication that Alvaro has sailed back to his homeland. She prays for forgiveness. Hearing the monks chanting inside the monastery, she rings the bell. Melitone, the doorkeeper, speaks to her from a window. At first he is reluctant to call the Father Superior, but he eventually does so. Alone with the Father Superior, Leonora reveals her identity as a woman and asks for the Father Superior’s mercy. He realizes who she is and asks her about her lover and her brother. He tells her she must join a convent. Leonora implores him not to send her away, so he finally agrees that she can live as a hermit in a nearby cave. Melitone summons the monks, who process into the chapel, and the Father Superior gives Leonora a Franciscan habit. He announces to the monks that a hermit is to live in their sacred cave but that anyone who goes there or tries to discover ‘his’ identity will be cursed. Leonora will never see another living soul and should ring a special bell if danger threatens her. Everyone offers a prayer to the Virgin as Leonora walks alone to the cave. In a wood at night, soldiers are playing cards. Their captain is Alvaro, who (under an assumed name) is fighting with the Spaniards. He reflects on his noble birth and his tragic early years and begs Leonora, whom he believes to be dead, to look down on him in his anguish. A cry for help is heard and Alvaro runs to investigate. 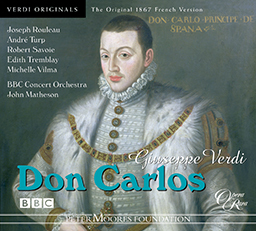 He returns with Don Carlo, who is now also in the Spanish army, having saved him from assassins. The two men hurriedly exchange false names and swear eternal allegiance, then run off to join the fighting. Morning has dawned. A surgeon and orderlies watch the nearby battle; Alvaro leads his troops to victory but is seriously wounded. He is carried in, accompanied by Carlo. Praising his bravery, Carlo promises him the Order of Calatrava. Alvaro recoils. He asks to speak to Carlo alone, to request that Carlo carry out his last wish: he gives Carlo a key to a case in which there is a package which Carlo must burn if Alvaro dies. Alone, Carlo recalls Alvaro’s shudder at the mention of Calatrava and begins to suspect that Alvaro might be Leonora’s seducer. Carlo opens the case and removes the package, wrestling with his conscience about opening it; but he throws it aside. He looks inside the case, however, and finds a portrait of Leonora. Realizing his suspicions were well founded, he vows to kill Alvaro. The surgeon returns to say that he has saved Alvaro’s life. Carlo expresses his joy at the prospect of now being able to wreak his vengeance. As the sun rises, the camp comes to life. The women camp-followers give the soldiers drink and Preziosilla offers to tell their fortunes. Trabuco appears, peddling trinkets. A group of peasants arrives; war has destroyed their livelihoods and they beg for bread. Next comes a group of homesick recruits, who are comforted and dragged off to dance. Melitone then arrives and delivers a comic sermon. The soldiers chase him away, leaving Preziosilla to lead a rousing drumming song (‘Rataplan’). Alvaro appears, followed by Carlo who inquires solicitously about Alvaro’s wounds. He then addresses Alvaro by his real name and reveals his own identity, challenging Alvaro to a duel. Alvaro protests his innocence: it was fate that killed the Marquis. Carlo says that Leonora is still alive. Alvaro is overjoyed, but Carlo vows that she and Alvaro will die. Alvaro and Carlo begin to fight. Alvaro kills Carlo and is overwhelmed by remorse. A group of soldiers goes past, calling him to fight against the Germans. Alvaro follows them; if he cannot find death on the battlefield, he swears he will give his life to God . The Father Superior is reading his prayer book. A group of beggars arrives. Melitone ladles out soup for them, but becomes increasingly irritated at their bickering, especially when they extol the virtues of Melitone’s fellow-monk, Raffaele. Melitone kicks the pot over. The Father Superior urges him to have greater humility, like Raffaele. Melitone tells the Father Superior of Raffaele’s recent strange behaviour. The bell rings. Melitone opens the gate to Carlo, who asks for Raffaele. Carlo knows that Alvaro thinks him dead and reiterates his resolve to avenge his family honour. Alvaro enters in a monk’s habit. Carlo challenges him to fight, but Alvaro wants only to be left in peace to serve his penance. Carlo will not be placated, even with Alvaro kneeling abjectly in front of him. When Carlo taunts him about his origins, and slaps his face, Alvaro can no longer restrain himself. The two men rush off. Ashen and distraught, Leonora prays to God for peace and reaffirms her love for Alvaro. She collects the food the Father Superior has left her and retreats hastily into her cave. Carlo and Alvaro approach, locked in combat. Carlo, mortally wounded, calls for a priest so Alvaro bangs on the cave door to call the ‘hermit’ to his assistance. Leonora rings her bell to summon help. She comes out and recognizes Alvaro. He tells her what has happened and that her brother is dying. She runs off to embrace Carlo who mortally wounds her. He then dies having avenged his honour. With her last breath, Leonora forgives her brother, declares her love to Alvaro and says that they will see each other again in Heaven. The Father Superior arrives with the friars and finds Leonora dead. He calls for Alvaro, but the man has climbed to the top of a cliff and throws himself to his death. Der Marquis wünscht seiner Tochter Leonora eine gute Nacht. Die Unruhe, die er an ihr bemerkt, führt er darauf zurück, dass er Leonora gezwungen hat, sich von ihrem Geliebten Alvaro zu trennen, einem Adeligen südamerikanischer Herkunft, den er als seiner Tochter unwürdig ablehnt. Der Marquis zieht sich zurück, und Leonoras Dienerin Curra fährt mit den Vorbereitungen für die Flucht Leonoras mit Alvaro fort. Leonora ist zögerlich, es bekümmert sie, ihren Vater zu hintergehen und ihre spanische Heimat zu verlassen. Traurig nimmt sie von ihrem Vaterland Abschied. Pferde sind zu hören, dann erscheint Alvara auf dem Balkon. Leonora gesteht ihm, dass sie nicht gehen möchte, bevor sie nicht ihren Vater noch einmal gesehen hat, doch Alvaro überredet sie, sofort mit ihm aufzubrechen. Gerade wollen sie auf den Balkon treten, als der Marquis hereinstürmt. Er befiehlt seinen Dienern, Alvaro festzunehmen. Alvaro, der Leonoras Unschuld beteuert, wirft seine Pistole zu Boden, ein Schuss löst sich und trifft den Marquis tödlich. Im Sterben verflucht er seine Tochter. Leonora und Alvaro brechen auf. Alvaro und Leonora sind durch die Umstände getrennt worden. In der Taverne singen und tanzen die Dorfbewohner und ein paar Maultiertreiber. Das Abendessen wird angekündigt. Ein „Student“ spricht das Tischgebet. (In Wirklichkeit ist es Don Carlo, der Sohn des Marquis, der sich auf die Suche nach seiner Schwester Leonora und ihrem Geliebten gemacht hat.) Leonora erscheint als Mann verkleidet; sie ist erst vor kurzem mit dem Maultiertreiber Trabuco eingetroffen. Sobald sie ihren Bruder erkennt, verschwindet sie wieder. Carlo will Trabuco nach seinem Reisebegleiter ausfragen, doch die beiden werden durch die Ankunft der Zigeunerin Preziosilla unterbrochen. Sie stachelt die Männer auf, nach Italien zu gehen und gegen die Deutschen zu kämpfen, dann stimmt sie ein mitreißendes patriotisches Lied an. Carlo unterbricht sie und bittet sie, ihm die Zukunft zu weissagen. Sie verheißt ihm Tragisches und gesteht ihm leise, dass sie seine Studentenverkleidung durchschaut habe. Eine Pilgergruppe zieht vorbei, und alle schließen sich ihren Gebeten an. Leonora tritt auf und betet darum, der Rache ihres Bruders zu entkommen, dann zieht sie sich erneut zurück. Wieder fragt Carlo Trabuco nach seinem Begleiter, der sich beim Essen nicht zu ihnen gesellt habe, doch Trabuco weicht jeder Antwort aus und geht zu Bett. Carlo wird daran gehindert, sich nach dem Unbekannten zu erkundigen, vielmehr muss er seine eigene Geschichte erzählen. Er gibt sich als Pereda aus und erklärt, er helfe seinem Freund Vargas, dessen Schwester und deren Geliebten zu finden, der Vargas’ Vater getötet habe und nach Amerika entkommen sei. Dann singt und tanzt die Gesellschaft wieder, bis sich alle schließlich für die Nacht zurückziehen. Im hellen Mondlicht wiederholt Leonora entsetzt die schreckliche Nachricht, die sie ihren Bruder erzählen hörte. Besonders bedrückt sie, dass Alvaro in seine Heimat zurückgekehrt sein soll. Im Gebet fleht sie um Vergebung. Als der Gesang der Mönche aus dem Kloster zu ihr herüberdringt, läutet sie an der Pforte. Der Pförtner Melitone, der durch ein Gitter in der Tür mit ihr spricht, weigert sich zunächst, den Prior zu holen, doch schließlich erfüllt er Leonoras Wunsch. Unter vier Augen mit dem Prior gibt Leonora sich als Frau zu erkennen und bittet um Erbarmen. Als dem Geistliche bewusst wird, wer in Wirklichkeit vor ihm steht, fragt er sie nach ihrem Geliebten und ihrem Bruder und rät ihr dann, in ein Nonnenkloster einzutreten. Doch Leonora fleht ihn an, sie nicht abzuweisen, und schließlich willigt er ein, sie als Einsiedlerin in einer nahe gelegenen Höhle leben zu lassen. Auf Melitones Aufforderung hin versammeln sich die Mönche in der Kapelle, wo der Prior Leonora eine Franziskanerkutte überreicht. Dann erklärt er den Mönchen, dass ein Einsiedler in der heiligen Klause leben werde und dass jeder, der „ihn“ dort zu stören oder seine Identität aufzudecken versucht, verflucht wird. Leonora wird nie einen anderen Menschen mehr sehen, doch sollte Gefahr drohen, kann sie eine Glocke läuten. Alle beten inbrünstig zur Muttergottes, während Leonora alleine zur Höhle schreitet. Soldaten sitzen nachts im Wald beim Kartenspiel. Ihr Hauptmann ist Alvaro, der unter einem angenommenen Namen auf Seiten der Spanier kämpft. Er sinniert über seine adelige Herkunft und die Tragik seiner jungen Jahre und bittet Leonora – die er tot wähnt –, seiner mitleidsvoll zu gedenken. Da ertönt ein Hilferuf, Alvaro geht dem Schrei nach. Er kehrt mit Don Carlo zurück, der mittlerweile ebenfalls in der spanischen Armee dient und gerade von Meuchelmördern überfallen wurde, vor denen Alvara ihn aber rettete. Rasch stellen die beiden Männer sich jeweils mit ihren falschen Namen vor, schwören einander ewige Treue und reihen sich dann in die Schlacht ein. Der Morgen bricht an. Ein Chirurg und mehrere Ordonnanzen beobachten die Schlacht, die vor ihren Augen stattfindet. Alvaro führt seine Männer zum Sieg, wird dabei aber schwer verletzt. Mit Carlo an seiner Seite wird er in das Offiziersquartier getragen. Carlo preist seine Kühnheit und verspricht ihm den Orden von Calatrava. Schaudernd bittet Alvaro darum, allein mit Carlo sprechen zu dürfen. Dann gibt er ihm den Schlüssel zu einen Handkoffer und bittet Carlo, sollte er sterben, ihm seinen letzten Wunsch zu erfüllen und ein Päckchen aus dem Koffer zu nehmen und zu verbrennen. Als Carlo wieder alleine ist, denkt er über Alvaros Schaudern bei der Erwähnung von Calatrava nach, und in ihm keimt der Verdacht, dass es sich bei Alvaro um Leonoras Geliebten handeln könnte. Er kämpft mit seinem Gewissen, doch sein Misstrauen obsiegt, er öffnet den Koffer und findet darin ein Porträt Leonoras. Da gelobt er, Alvaro zu töten. Der Chirurg tritt ein und erklärt, er habe Alvaros Leben gerettet. Carlo ist hoch erfreut, denn nun kann er selbst Rache an dem Verräter üben. Bei Sonnenaufgang erwacht das Lager zu Leben. Die Marketenderinnen schenken den Soldaten zu trinken aus, Preziosilla erbietet sich, ihnen die Zukunft zu prophezeien. Trabuco erscheint und will seine Trödelwaren verkaufen. Eine vorbeiziehende Schar von Bauern bettelt um ein Stück Brot, da der Krieg sie ihres Lebensunterhalts beraubt hat. Als nächstes kommt eine Gruppe heimwehkranker Rekruten, die sich trösten und dann zum Tanzen überreden lassen. Schließlich tritt Melitone auf und hält eine komische Predigt. Die Soldaten vertreiben ihn und stimmen mit Preziosilla ein mitreißendes Trommlerlied an („Rataplan“). Alvaro tritt auf, gefolgt von Carlo, der sich angelegentlich nach seinen Verletzungen erkundigt. Dann spricht er Alvaro mit richtigem Namen an, gibt sich selbst zu erkennen und fordert ihn zum Duell heraus. Alvaro beteuert seine Unschuld, nur das Schicksal habe den Marquis getötet. Überglücklich erfährt Alvaro von Carlo, dass Leonora noch am Leben ist, doch Carlo gelobt, dass sie und auch Alvaro sterben müssen. Die beiden Männer kämpfen, dabei versetzt Alvaro seinem Widersacher eine tödliche Verletzung und wird dann von Reue übermannt. Eine Patrouille zieht durchs Lager und fordert ihn auf, gegen die Deutschen zu kämpfen. Alvaro folgt ihnen und schwört, sein Leben Gott zu weihen, wenn er nicht auf dem Schlachtfeld den Tod findet. Der Prior liest in seinem Brevier. Eine Gruppe Bettler kommt hinzu. Melitone teilt Suppe unter ihnen aus, ärgert sich aber zunehmend über ihre Zänkereien, insbesondere, als sie von den Tugenden Raffaeles zu schwärmen beginnen, einem Mitbruder Melitones. Dieser versetzt dem Suppentopf einen Fußtritt. Der Prior ermahnt ihn, größere Demut zu zeigen, so wie Raffaele es tue. Da berichtet Melitone dem Prior von dem seltsamen Verhalten, das Raffaele in letzter Zeit an den Tag legt. Es läutet an der Pforte. Melitone öffnet und steht Carlo gegenüber, der nach Raffaele verlangt. Carlo weiß, dass Alvaro ihn für tot hält, und bekräftigt seinen Schwur, die Ehre seiner Familie zu rächen. Als Alvaro in der Mönchskutte vor ihm erscheint, fordert Carlo ihn zum Kampf heraus, aber Alvaro will nur noch in Ruhe Buße üben. Doch Carlo lässt sich nicht beschwichtigen, selbst dann nicht, als Alvaro sich flehentlich vor ihn niederkniet. Als Carlo ihn ob seiner Herkunft verspottet und ihm eine Ohrfeige versetzt, kann Alvaro nicht mehr an sich halten. Die beiden Männer stürmen davon. Aschfahl und zutiefst bekümmert fleht Leonora zu Gott um Frieden und beteuert ihre Liebe zu Alvaro. Sie holt das Essen, das der Prior für sie bereitstellte, und zieht sich rasch wieder in ihre Klause zurück. Carlo und Alvaro kommen kämpfend näher. Tödlich verwundet verlangt Carlo nach einem Priester, und so klopft Alvaro an der Tür der Klause, um den „Einsiedler“ um Beistand zu bitten. Leonora läutet die Glocke, um Hilfe herbeizurufen. Dann tritt sie vor die Klause und erkennt Alvaro. Als er ihr berichtet, was passiert ist und dass ihr Bruder im Sterben liegt, läuft sie zu Carlo und umarmt ihn. Da versetzt er ihr einen tödlichen Stoß. Seine Ehre ist gerächt, er stirbt. Mit ihrem letzten Atemzug verzeiht Leonora ihrem Bruder, versichert Alvaro ihrer Liebe und sagt, dass sie sich im Himmel wiedersehen werden. Der Prior kommt mit den Mönchen herbei und findet Leonora tot am Boden liegen. Er ruft nach Alvaro, doch der ist auf einen Felsen geklettert und stürzt sich in den Tod. Il marchese augura la buonanotte a sua figlia Leonora, che appare ansiosa. Il padre immagina che questo sia dovuto alla proibizione di vedere Alvaro, un nobile di origini sudamericane di cui la donna è innamorata, ma che il padre non considera adeguato per lei. Il marchese esce e la domestica di Leonora, Curra, prosegue nei preparativi per la fuga della sua padrona con Alvaro, che verrà a prenderla quella notte stessa. Leonora esita, riluttante a ingannare il padre e lasciare la Spagna, il paese in cui è nata; dà un triste addio alla sua patria. Si sente un rumore di cavalli e Alvaro entra dal balcone. Leonora gli dice che desidera rivedere ancora una volta il padre prima di fuggire. Alvaro la persuade a seguirlo subito e i due si dirigono verso il balcone. Ma si sente il rumore di alcuni passi che si avvicinano; nella stanza irrompe il marchese che ordina ai suoi servi di arrestare Alvaro. Il giovane il quale giura che Leonora è innocente e getta a terra la propria pistola. Dall’arma parte un colpo e ferisce a morte il marchese il quale, con l’estremo respiro, maledice la figlia. La donna e Alvaro fuggono. Alvaro e Leonora sono stati separati dalle circostanze. Nella locanda gli abitanti del villaggio e alcuni mulattieri cantano e ballano mentre viene annunciata la cena. Uno “studente” recita la preghiera di ringraziamento. (In realtà si tratta di don Carlo, figlio del marchese, travestito, che va in cerca di sua sorella Leonora e del suo amante.) Entra Leonora vestita da uomo, essendo arrivata da poco con Trabuco, un mulattiere, riconosce il fratello e si allontana in fretta. Carlo comincia a fare domande a Trabuco sull’identità del suo compagno di viaggio, ma i due vengono interrotti dall’arrivo della zingara Preziosilla. La donna sollecita gli uomini a recarsi in Italia per combattere contro i tedeschi invasori e canta una vivace canzone patriottica. Carlo la interrompe per chiederle di leggergli la sorte. La donna predice tragedia e gli dice a bassa voce di sapere che lui non è uno studente. Alcuni pellegrini passano dal villaggio e tutti si uniscono a loro per pregare. Ricompare Leonora e prega di essere salvata dalla vendetta del fratello e si ritira. Carlo torna a chiedere a Trabuco notizie del suo compagno che non è andato a cenare con loro. Trabuco evita di rispondere e va a letto. Carlo vorrebbe cercare lo strano visitatore ma la cosa gli viene impedita e gli viene chiesto di spiegare la propria identità. Il giovane dichiara di chiamarsi Pereda e di aver aiutato il suo amico Vargas a trovare la sorella e il suo amante che avevano ucciso il padre dell’amico; l’amante però è fuggito e si è imbarcato per l’America. Il gruppo di commensali ricomincia a cantare e a ballare prima che tutti si ritirino per la notte. Sotto il chiaro di luna Leonora, sfinita, ricorda il proprio orrore nell’udire la terribile storia del fratello; la opprime soprattutto la notizia che Alvaro abbia fatto ritorno nella propria patria. La donna prega, chiedendo perdono. Sentendo i frati cantare nel monastero, suona il campanello. Melitone, il custode, le parla da dietro una finestra. Inizialmente è riluttante a chiamare il superiore, ma alla fine si convince a farlo. Sola con il padre guardiano, Leonora rivela la propria identità e chiede clemenza. Il frate capisce chi sia la donna e le chiede notizie dell’amante e del fratello. Le dice di entrare in convento, ma Leonora lo supplica di non allontanarla; alla fine il frate le concede di vivere come un eremita in una grotta vicina. Melitone chiama i frati che entrano in processione nella cappella e il superiore consegna a Leonora un saio francescano. Dichiara ai frati che nella loro sacra grotta andrà a vivere un eremita ma che è vietato avvicinarsi a lui o cercare di scoprire la sua identità, pena la maledizione. Leonora non vedrà più anima viva e dovrà suonare un campanello speciale in caso di pericolo. Tutti pregano la Vergine mentre Leonora si incammina da sola verso la grotta. In un bosco, di notte, i soldati giocano a carte. Il loro capitano è Alvaro, che (sotto falso nome) combatte con gli Spagnoli. L’uomo riflette sui suoi nobili natali e la sua tragica infanzia e supplica Leonora, che crede morta, di volgere lo sguardo a lui dal Cielo. Si sente un’invocazione d’aiuto e Alvaro si precipita a vedere. Ritorna dopo aver salvato da alcuni assassini don Carlo, anche lui arruolatosi nell’esercito spagnolo. I due si scambiano in fretta nomi falsi e si giurano amicizia eterna, quindi escono correndo per riprendere la battaglia. Si è fatto giorno. Un medico e alcune ordinanze osservano la battaglia vicina; Alvaro guida le sue truppe alla vittoria, ma è gravemente ferito. Viene trasportato sulla scena, accompagnato da Carlo, che loda il suo coraggio e gli promette l’Ordine di Calatrava. Alvaro ha un moto di orrore e chiede di rimanere da solo con Carlo, per chiedergli di esaudire il suo ultimo desiderio. Consegna a Carlo la chiave di una valigia in cui si trova un plico, che dovrà essere bruciato se Alvaro muore. Rimasto solo, Carlo ricorda la reazione di Alvaro alla menzione del nome Calatrava e comincia a sospettare che l’amico possa essere il seduttore di Leonora. Apre il baule e ne estrae il plico; è tentato di aprirlo, ma la sua coscienza glielo impedisce. Nella valigia, però, trova un ritratto di Leonora. Rendendosi conti che i suoi sospetti sono fondati, giura di uccidere Alvaro. Rientra il chirurgo che è riuscito a salvare la vita di Alvaro. Carlo esprime la propria gioia alla prospettiva di potersi finalmente vendicare. Mentre sorge il sole, l’accampamento si anima. Le donne dell’accampamento danno da bere ai soldati e Preziosilla si offre di predir loro il futuro. Entra Trabuco, che vende oggetti di poco valore. Arriva un gruppo di contadini; la guerra ha distrutto i loro campi e chiedono del pane. Poi arriva un gruppo di reclute che hanno nostalgia di casa: vengono confortate e trascinate a ballare. Infine arriva Melitone che pronuncia un comico sermone. I soldati lo cacciano via, lasciando Preziosilla a intonare un vivace canto di tamburi (‘Rataplan’). Entra Alvaro, seguito da Carlo che si informa, premuroso, sullo stato delle sue ferite. Quindi si rivolge a lui chiamandolo con il suo vero nome e rivela la propria identità, sfidando l’amico a duello. Alvaro protesta la propria innocenza: è stata una fatalità a uccidere il marchese. Carlo dichiara che Leonora è ancora viva. Alvaro è sopraffatto dalla gioia, ma Carlo giura che lei e Alvaro morranno. I due iniziano a duellare. Alvaro uccide Carlo ed è sopraffatto dal rimorso. Passa una pattuglia di soldati, che lo chiamano a combattere contro i tedeschi. Alvaro li segue e giura di dare la propria vita sul campo di battaglia o di dedicarla al servizio di Dio. Il padre Guardiano legge il breviario. Arriva un gruppo di mendicanti. Melitone scodella della minestra, ma è sempre più irritato dai loro battibecchi, specialmente quando cominciano a lodare le virtù di un altro frate, Raffaele. Con un calcio Melitone rovescia la pentola. Il padre Guardiano lo sollecita a mostrare più umiltà, come Raffaele. Melitone gli riferisce che Raffaele negli ultimi tempi si comporta in modo strano. Suona la campana. Melitone apre il cancello a Carlo, che chiede di Raffaele. Carlo sa che Alvaro lo crede morto e ribadisce il suo intento di vendicare l’onore della propria famiglia. Entra Alvaro vestito da frate. Carlo lo sfida a duello, ma Alvaro vuole solo essere lasciato in pace a servire la sua penitenza. Carlo non si lascia persuadere, nemmeno quando Alvaro si umilia, inginocchiandosi davanti a lui. Quando Carlo schernisce le sue origini e lo schiaffeggia, Alvaro non riesce più a trattenersi e tutti e due si precipitano fuori scena. Pallidissima e sconvolta, Leonora prega Dio di concederle la pace e dichiara il suo amore per Alvaro. Raccoglie il cibo che il padre Guardiano le ha lasciato e si ritira in fretta nella grotta. Si avvicinano Carlo e Alvaro, impegnati nel duello. Carlo, mortalmente ferito, invoca un prete, così Alvaro bussa alla porta della grotta per chiedere aiuto. Leonora suona la sua campana per chiedere aiuto. Esce e riconosce Alvaro. Lui le racconta l’accaduto e le dice che suo fratello è in punto di morte. La donna si precipita verso Carlo, che la colpisce a morte. L’onore è vendicato e l’uomo può morire sereno. Con l’ultimo respiro Leonora perdona il fratello, dichiara il proprio amore per Alvaro e gli dice che saranno riuniti nell’aldilà. Entrano il Padre Guardiano e i frati che trovano Leonora morta. Il Padre chiama Alvaro, ma l’uomo si è arrampicato in cima a una rupe e si uccide gettandosi nel vuoto. Le marquis vient embrasser sa fille Leonora avant la nuit. Il la trouve anxieuse, mais en attribue la cause au fait qu’il l’a arrachée à Alvaro, jeune noble originaire d’Amérique du Sud dont elle s’est éprise mais qu’il considère indigne d’elle. Le marquis prend congé et la camériste de Leonora, Curra, continue les préparatifs en vue de l’enlèvement de Leonora par Alvaro, la nuit même. Leonora hésite, affligée à l’idée de tromper son père et de quitter l’Espagne ; c’est avec tristesse qu’elle s’apprête à quitter sa terre natale. On entend des chevaux arriver et Alvaro apparaît sur le balcon. Leonora lui annonce qu’elle hésite à s’enfuir sans avoir revu, une dernière fois, son père. Alvaro la convainc de ne pas retarder leur départ et ils se dirigent vers le balcon. Un bruit de pas se fait entendre et le marquis fait brusquement son entrée. Il ordonne à ses serviteurs d’arrêter Alvaro, qui proteste de l’innocence de Leonora et jette son pistolet. Le coup part accidentellement, blessant mortellement le marquis, lequel maudit sa fille avant d’expirer. Leonora et Alvaro prennent la fuite. Alvaro et Leonora ont été séparés par les circonstances. À l’auberge locale, villageois et muletiers chantent et dansent en attendant que soit servi le repas du soir. Un « étudiant » dit le bénédicité. (Il s’agit en fait de Don Carlo, le fils du marquis, qui s’est déguisé pour retrouver sa sœur et Alvaro.) Apparaît Leonora, habillée en homme – elle vient d’arriver en compagnie de Trabuco, le muletier. Elle reconnaît son frère et s’esquive rapidement. Carlo se met à questionner Trabuco sur l’identité de son compagnon de voyage, mais leur conversation est interrompue par l’arrivée de la gitane Preziosilla. Elle presse les hommes de rejoindre l’Italie pour se battre contre l’envahisseur allemand, et entonne un chant patriotique entraînant. Carlo l’interrompt pour lui demander de lire les lignes de sa main. Elle lui prédit une tragédie et lui signale discrètement qu’elle n’est pas dupe de son déguisement. Des pèlerins défilent devant l’auberge et tout le monde prie avec eux. Leonora réapparaît, elle prie le Seigneur de la préserver de la vengeance de son frère et se retire. Carlo questionne de nouveau Trabuco afin de savoir pourquoi son compagnon n’est pas venu se mettre à table. Trabuco évite de répondre et va se coucher. Carlo déclare alors qu’il a l’intention de demander lui-même à l’étrange visiteur de lui révéler son identité, mais il en est empêché. Interrogé à son tour, Carlo dit qu’il a pour nom Pereda et que son ami Vargas lui a demandé de l’aider à retrouver sa sœur ainsi que l’amant de celle-ci qui a tué le père de Vargas ; le meurtrier leur a toutefois échappé et s’est embarqué pour l’Amérique. Les autres personnages se remettent à chanter et danser, puis tout le monde se retire pour la nuit. Sous un clair de lune éclatant, Leonora, épuisée, se remémore avec horreur la terrible histoire qu’a racontée son frère ; elle est surtout bouleversée à l’idée qu’Alvaro ait pris la mer pour retourner dans son pays. Elle demande pardon en prières. Tandis que le chant des moines s’élève à l’intérieur du monastère, elle sonne la cloche. Le frère Melitone vient lui répondre à travers le judas de la porte. D’abord peu disposé à appeler le père supérieur, il finit par céder. Une fois seule avec le père supérieur, Leonora lui révèle qu’elle est une femme et le supplie de la prendre en pitié. Comprenant de qui il s’agit, il lui demande ce qui est advenu de son amant et de son frère. Leonora l’implore de ne pas la renvoyer, aussi finit-il par accepter de la laisser vivre en ermite dans une grotte toute proche. À l’appel de Melitone, les moines se rendent à la chapelle et le père supérieur remet à Leonora un habit de franciscain. Il annonce aux moines qu’un ermite va vivre dans leur grotte sacrée et que quiconque s’en approche ou cherche à percer l’identité de son occupant sera frappé de malédiction. Leonora ne reverra plus jamais âme qui vive. En cas de dernière extrémité, elle pourra alerter les moines en sonnant une cloche réservée à cet effet. Tandis que Leonora se dirige vers la grotte, les moines adressent une prière à la Vierge. Dans un bois, la nuit, des soldats jouent aux cartes. Ils ont pour capitaine Alvaro, qui (sous un nom d’emprunt) est venu combattre avec les Espagnols. Il songe à sa noble ascendance, au malheur qui l’a frappé dès l’enfance, et supplie Leonora, qu’il croit morte, de le réconforter du haut du Ciel. Un appel au secours se fait alors entendre et Alvaro se précipite pour voir ce qu’il en est. Il revient avec Don Carlo, lui aussi officier dans l’armée espagnole, auquel il vient de sauver la vie. Les deux hommes déclinent sans tarder leur (fausse) identité, se jurent une amitié éternelle, puis repartent au combat. L’aube pointe. Un chirurgien et des ordonnances observent la bataille qui fait rage non loin ; Alors qu’il mène ses troupes à la victoire, Alvaro est gravement blessé. On le ramène sur un brancard accompagné de Carlo. Celui-ci le félicite pour son courage et lui promet de le faire chevalier de l’Ordre de Calatrava. Alvaro frémit. Il souhaite s’entretenir en privé avec Carlo afin de lui confier ses dernières volontés : il lui remet une clé, qui ouvre une mallette contenant un pli que Carlo devra brûler s’il meurt. Seul, Carlo se souvient de la réaction d’Alvaro au nom de Calatrava et commence à soupçonner Alvaro d’être le séducteur de Leonora. Carlo ouvre la mallette et en retire le pli ; il est tenté de l’ouvrir, mais résiste. Il fouille toutefois la mallette et y découvre un portrait de Leonora. Comprenant alors que ses soupçons étaient fondés, il jure de tuer Alvaro. Le chirurgien vient annoncer qu’Alvaro est sauvé. Carlo exprime sa joie à la perspective de pouvoir maintenant accomplir sa vengeance. Le jour se lève et le camp s’anime. Les vivandières apportent à boire aux soldats et Preziosilla se propose pour leur dire la bonne aventure. Trabuco vient leur vendre des colifichets. Arrive un groupe de paysans ; la guerre a détruit leurs moyens d’existence et ils mendient du pain. Viennent ensuite de nouvelles recrues qui se languissent de leur village, et que l’on les réconforte avant de les entraîner dans la danse. Arrive ensuite Melitone qui se lance dans un sermon comique. Les soldats le poursuivent et c’est à Preziosilla que revient la tâche d’entonner une marche militaire (« Rataplan »). Alvaro apparaît, perdu dans ses pensées, suivi de Carlo qui s’enquiert avec sollicitude de l’état de ses blessures. Carlo interpelle ensuite Alvaro par son vrai nom et lui révèle sa véritable identité avant de le provoquer en duel. Alvaro proteste de son innocence : c’est la fatalité qui a causé la mort du marquis. Carlo lui apprend que Leonora est vivante. Alvaro est au comble de la joie, mais Carlo jure que les tuer tous les deux, elle et Alvaro. Les deux hommes commencent à se battre. Alvaro tue Carlo et il est immédiatement accablé par le remords. Des soldats qui passent par là l’appellent au combat contre les Allemands. Alvaro les suit. S’il ne trouve pas la mort sur le champ de bataille, il jure de consacrer le restant de ses jours au Seigneur. Le père supérieur lit son missel. Arrivent des mendiants. Melitone leur sert de la soupe, mais son irritation va croissante à les voir se chamailler entre eux et faire l’éloge du frère Raffaele. Melitone finit par renverser la marmite d’un coup de pied. Le père supérieur l’enjoint de faire davantage preuve d’humilité, comme le frère Raffaele. En réponse, Melitone lui raconte que celui-ci se comporte bizarrement depuis quelque temps. La cloche sonne et Melitone va ouvrir la porte. C’est Carlo qui demande à voir Raffaele. Carlo, qui sait qu’Alvaro le croit mort, réaffirme sa volonté de venger l’honneur de sa famille. Arrive Alvaro en habit de moine. Carlo le défie en duel, mais Alvaro n’a d’autre volonté que celle de vivre en paix et de faire pénitence. Carlo refuse de se calmer, même lorsqu’Alvaro tombe humblement à genoux devant lui. Mais quand Carlo le raille sur ses origines et lui donne un soufflet, Alvaro perd toute retenue. Les deux hommes s’éloignent ensemble précipitamment. Pâle et accablée, Leonora prie le Seigneur de lui donner la paix et réaffirme son amour pour Alvaro. Elle ramasse les vivres que le père supérieur a déposés à son intention et se retire rapidement dans la grotte. Approchent Carlo et Alvaro en plein duel. Carlo, mortellement blessé, demande un prêtre. Aussi Alvaro frappe-t-il à la porte de la grotte pour solliciter l’assistance de l’« ermite ». Leonora sonne la cloche pour appeler à l’aide. Elle sort et reconnaît Alvaro. Il lui apprend ce qui s’est passé et lui dit que son frère est mourant. Elle court embrasser Carlo qui lui inflige un coup mortel. Il a ainsi vengé son honneur avant de mourir. Dans son dernier souffle, Leonora pardonne à son frère, déclare son amour à Alvaro et lui dit qu’ils se reverront au Ciel. Le père supérieur, arrivé en compagnie des moines, trouve Leonora morte. Il appelle Alvaro, mais celui-ci, du sommet d’un rocher voisin, se précipite dans le vide.